Fluxiom offers two ways to search for documents: simple search and full text search. Simple search will search for the title, name, extension, description and metadata (IPTC and EXIF) of your files. Full text search will dig into the contents of your files and search for that text string inside the files themselves. Full text search works for over 100 formats, including PDF, Adobe CS and Microsoft Office documents. To launch a simple search, simply start typing into the Search Field located above the Tag Bar in your Asset View. The search results are updated in real time as you type. By the time you are finished typing, only the relevant documents are shown to you. If this simple search did not return the content you were expecting, simply click on the ABC Button next to the Search Field to launch a full text search using the query you have just typed. The Asset View will refresh and show you all files that contain the search string. If you do not see an ABC Button, it is possible that full text search is not enabled for your service plan. Please have a look at our pricing page for more details. To exit search mode, simply click on the small cross button inside the search field itself. This will reset your Asset View to the state it was in, before you started searching. Search operations respect your current tags settings. If you launch a search while filtering your files by tag, then only files with this particular tag will be searched through. This allows you to perform very advanced searches quickly and easily. If you do not wish to filter files by tag as you search, be sure to click on the Reset Button on the left of the Search field before you begin. 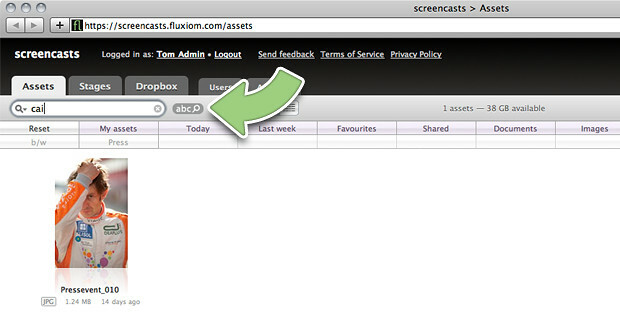 This will ensure that Fluxiom searches through all the files in your account.